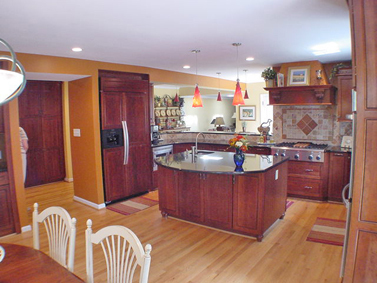 Creative Wood Concepts strives to do a great job every time, and our customers help prove it! Below are some comments. If you have a question for the pros, contact us and we'll help! Thank you SO much for the amazing work you did on our kitchen. The process was smooth, there were no (bad) surprises with the work or budget, and the results are stunning! We enjoyed having Dan and Greg here every day - they made a disruptive process as easy as possible. Dan was excellent at keeping us informed throughout, and obviously their craftmanship is top notch. I would be happy to write you a testimonial for your marketing materials, and will be recommending CWC to whomever will listen! Thanks so much for everything - we are thrilled! I wanted to take a moment to thank you for the wonderful job you did designing and installing the portico on the front of my home. 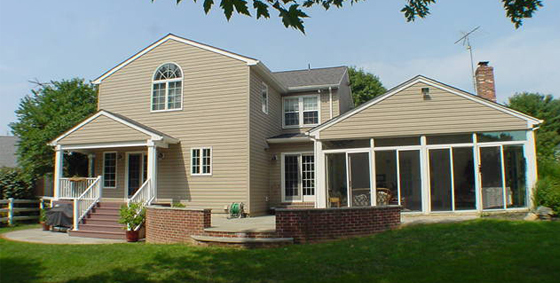 I know the orientation of my house and the odd pitch of the roof were a challenge that other companies could not easily tackle, and CWC came up with a perfect solution. The construction quality is excellent and best of all, it matches the house so seamlessly that it looks like it's always been part of it. Thanks for being flexible, showing up on time, finishing the job on schedule, leaving the worksite clean and free of construction debris, and keeping me posted on the progress throughout the project. I have worked with other contractors in the past and have never been as satisfied as I am with Creative Wood Concepts' performance and results. I would be happy to be a reference for any future clients who would like to inquire about the experience of working with CWC. Feel free to give them my cell phone number. Thanks again – I love my new portico! The check for the final payment on our basement project will be mailed this evening. I would like to express our complete satisfaction with your performance on this project. We were extremely impressed with the professionalism, care and expertise that you demonstrated throughout the job, from the survey, planning & design, through the construction, completion and followup. In addition to the quality of the work, among the things that I would categorize as "pleasant surprises" were the emphasis on keeping us completely informed of all that was going on, and the consistent attention to leaving the area clean, safe and presentable at the end of every single work day. It was very clear that you always kept in mind that your job site happened to also be someone's home. Most importantly of all, we could not be more pleased with the final product, which we are certain will provide us with enjoyment and convenience for years to come. It has been a great pleasure working with you. Please do not hesitate to cite us as a reference for future prospective customers, as we will be happy to provide a strong recommendation to whomever should ask. Thank you for the excellent job that your company did on our garage. I was very impressed by the professional manner in which you handled the problem with the floor. If you ever want to bring someone over to see the job or need a reference, please feel free to call. Thank you, DAN, GREG, MIKE and JORGE for your total dedication to completing our finished basement. Communication was superb. We were always kept abreast of how things went during the day/week. Timing was impeccable! If Greg said he'd be there at 8am-he was there ON TIME. And he, Mike and Jorge would work until the day came to a close or the work was completed. Scheduling of the various subcontractors (electricians, plumbers, drywall, tile, etc) was amazing always co-ordinated extremely well. I believe since you have an ongoing longterm relationship with these venues-you all work well together and respect each others time commitments. Poor Dan was never off the phone and he was always running! What this means to the next client is that your main project manager is always working hard (and overworking) to oversee his projects and make sure everything is done the way it's supposed to work. Everyone learns something from Dan!! They were very concerned about what the project looked like at the end of the day-cleanup was important. It didn't bother me if something wasn't swept up but they minded and made sure it looked clean and neat. And Rick, you have always been right there when I had a question via phone and always by email. From the get go--you were very time conscious about meetings and appointments and were always on top of the business to insure everything was done properly. I also like that you have your guys report back to you after the days over-communication at it's finest! Hoping to call on you again in the future and of course will (and have already) passed along referrals to you. Bless you as you enjoy the holiday time with family and friends. Tell the guys to stop by for a game of pool in our newly finished basement! !